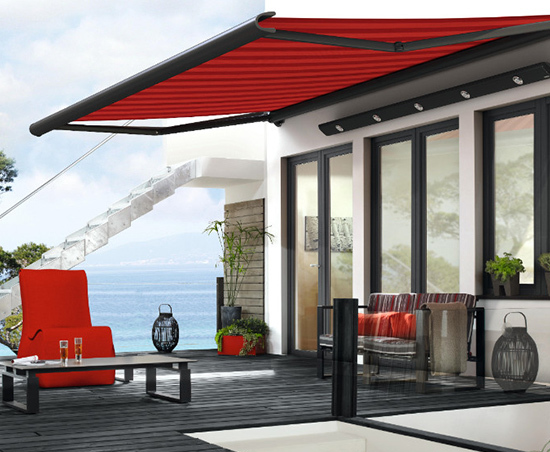 With our beautiful selection of markilux awnings, you will be able to enjoy your outdoor space whenever you want. We offer an extensive range of stunning and highly efficient domestic awnings, all of which are installed by professionals at a time that best suits you. The range of patio and balcony awnings we have available covers all kinds of requirements and needs which is why we provide a FREE quote to ensure the right awning is chosen and installed for your property. If you have something specific in mind, speak to our professional installers and they will provide friendly and helpful advice. 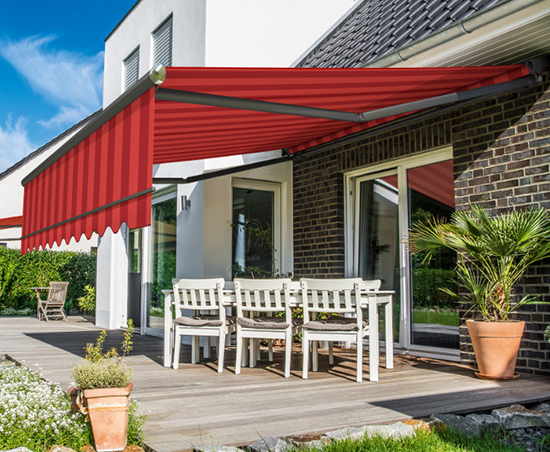 Boasting many benefits throughout the year, house awnings create a great place to sit back and relax both when it is raining and when the sun is shining. 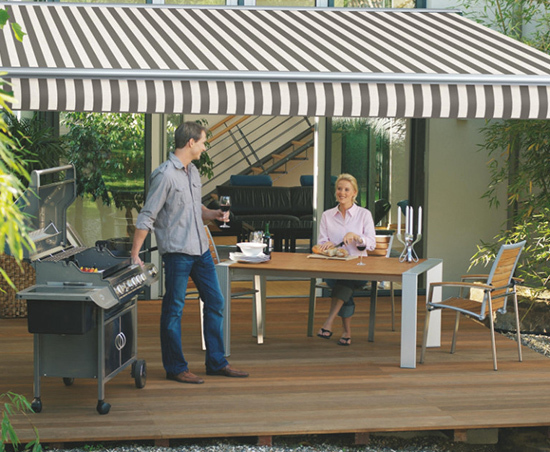 Balcony awnings give you the chance to sit out and relax on your balcony while our range of patio awnings create a protected area from the sun or rain when trying to start up a BBQ. 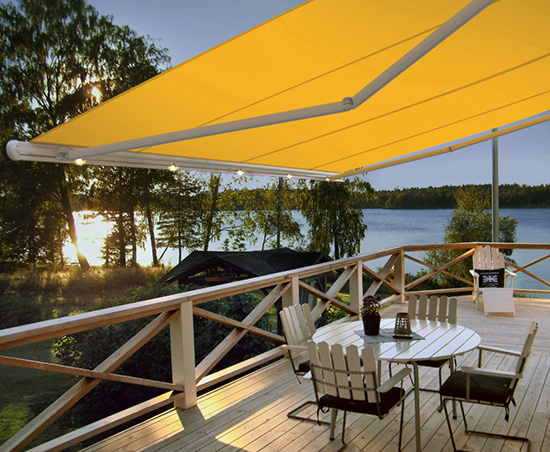 Below you will find a range of our products from our patio and balcony awning range. 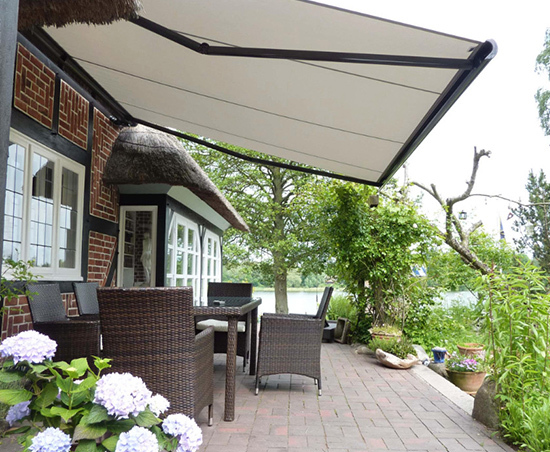 Our beautiful selection of garden awnings transform your outdoor space to something much more enjoyable and is a stunning addition for any home. From rollers, to hingers and steel-link-chains, we will supply and install the domestic awnings that best suit your home. Get in contact with our specialist team today on 01732 809341 to arrange your measurement and quotation. 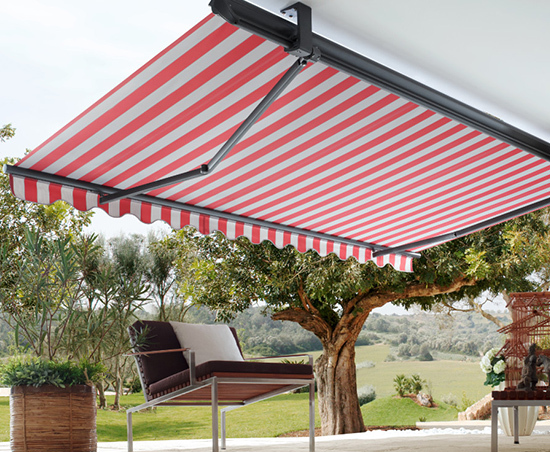 Strong and sturdy, the markilux 1300 Basic has distinctively shaped arms and a round steel-link-chain to make sure that the awning is straight and will not fly away or break if there is too much wind. The markilux 1300 Basic provides the right amount of shade for your outdoor space, while allowing you to make the most of the sun. With a pivoting mechanism that will adapt to all conditions, it is especially suited for placement under overhanging roofs. It will not move upwards when it is too windy, meaning that you will get an awning that stays where it is and keeps you cool in the shade for as long as you need. With no added mechanisms, it isn’t big and clunky either, meaning that it will fit exactly where you want it to. The markilux 1700 has a sleek and elegant design, with a large surface area meaning that a bigger area of your patio or balcony will be shaded. 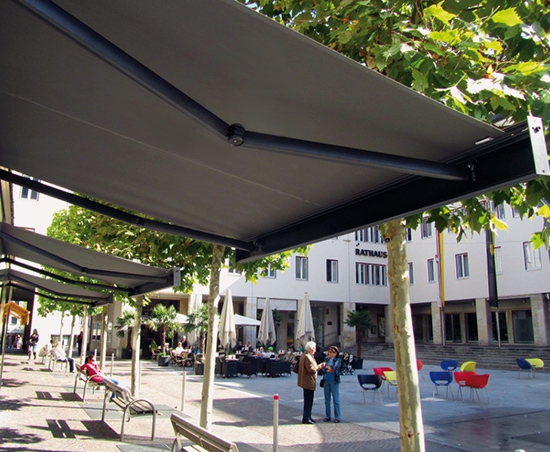 With a bionic tendon and high tensile strength this guarantees you a noiseless opening and closing of your awning with no worry of the fabric getting stuck or creasing. With its small and compact size, the markilux 990 is perfect for fitting to any outdoor wall or ceiling. It is easy to open and easy to close again, with a u-shaped front and folding arms that move smoothly and with little noise. It is an elegant choice for your patio or balcony, meaning that you can fit it anywhere without it being obtrusive or needing a large, free space. There are many elements of the markilux 1600 that makes it one of the best designs around. 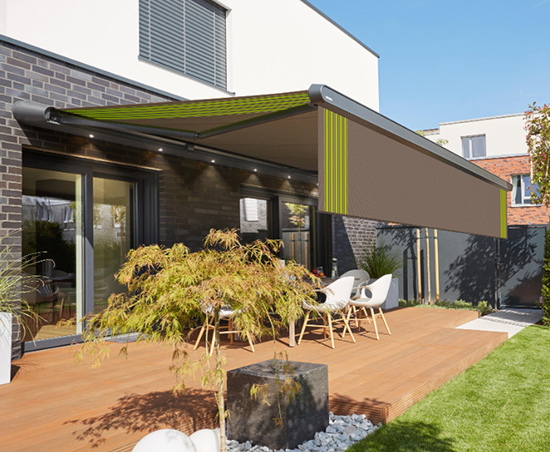 From its IF product design award winning aluminium front profile, to its coverboard that adapts to the awning’s angle and is used to brush off unwanted dirt and debris. With a whole 400cm of maximum protection from the elements, the markilux 1600 is a must for your patio or balcony. With a sturdy construction, it is surprising how light and elegant the markilux 1710 really is. 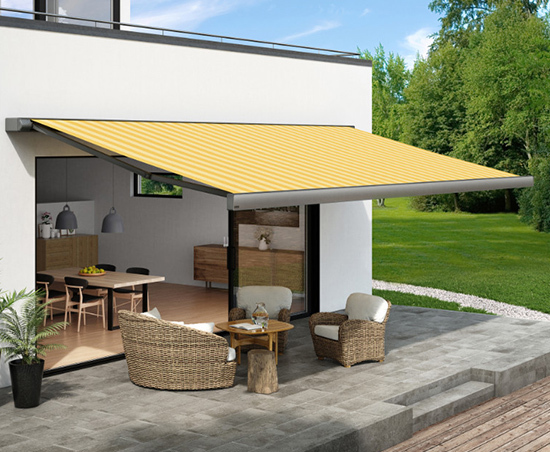 It covers a large area with its special folding arm technology, so you can definitely rely on it to keep you shaded on hot summer days, and know that it won’t pick up or snap if a strong gust of wind rolls by. In case of rain, the cassette protects the awning and there is an integrated gutter and several water drainage spouts so that water does not collect and instead runs off. Having the markilux 970 above your patio or balcony will make you the talk of the town, with its chic appearance, range of colours and easy-to-use controls. The swivel joint means that you will always have your awning at exactly the right angle to give you some privacy and thanks to LED spotlights, you can even use your awning in the evening to keep off the cool night breeze. 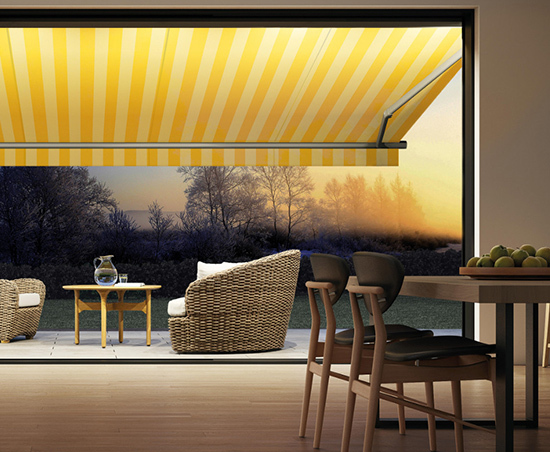 A huge awning for your patio and balcony area, the markilux 5010 seven metres wide, so it’s perfect for bigger outdoor areas. It has a slim look and the cassette brushes debris and dirt away when closing. With a range of classic colours, it isn’t designed to stand out, but blend in to your home while looking as natural as possible. Having received the red dot design away, it’s no wonder that the markilux 6000 is so popular. It has an extremely elegant design, with entirely unique technology and extras that make it even more special. 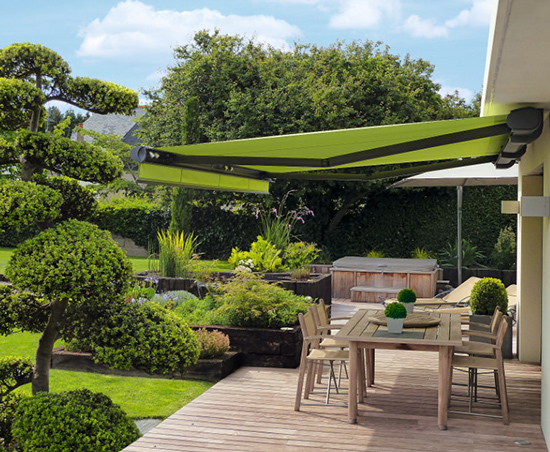 It has colours and styles that will match any kind of house, with elbow joint awning arms that mean it has a very wide reach, keeping you cool and shaded for longer. Nearly identical to the markilux 1600, the markilux 1650 has a few, subtle differences that enhances its use and makes it even better. With integrated LED spotlights, you can not only spend your days out on your patio or balcony, but your nights, too. With a 90 degree rotatable angle, you can point them whichever way is best for you and with a width of up to 710cm, the markilux 1650 shades a very large area of your outdoor space. 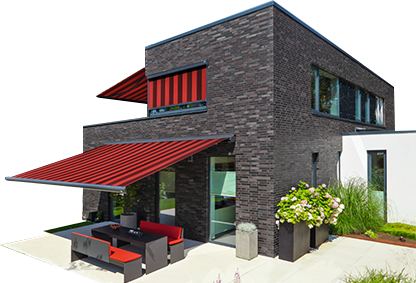 The markilux MX-1 compact is the future of awnings, with a range of equipment features and design additions that really change the way it operates. However, it is the compact version of the markilux MX, meaning that it has a construction depth of only 40cm, but that doesn’t take away its impressiveness or usefulness. It has a bionic tendon, 5-25 degrees tilt adjustment, water drainage and a large range of colour variations. 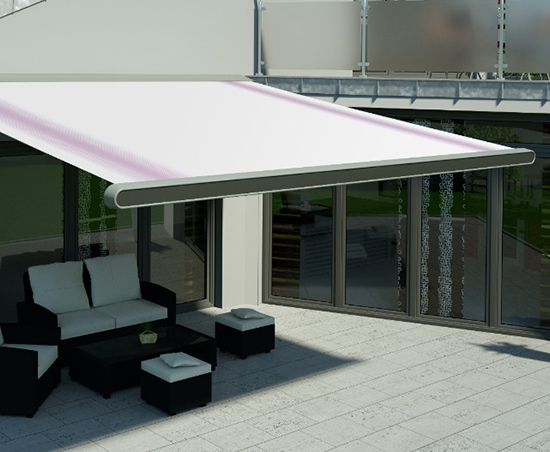 The markilux MX-1 is the pinnacle of awning technology, as a combination of a protective roof and an awning. It has folding arms with bionic tendon, a 5-25 degree tilt adjustment via a tilt joint, water drainage, a range of colour variations and additional equipment that really adds to the usage. The MX-1 has a lightweight appearance, even though it has very large dimensions, covering a huge area of your patio or balcony. There is no doubt that the markilux ES-1 is a fantastically designed piece of equipment. 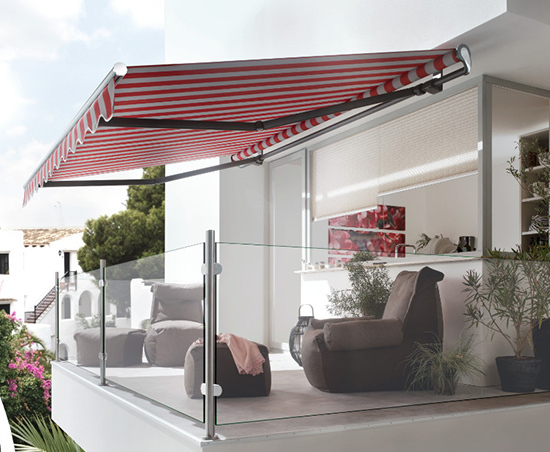 Having won the Red Dot Design Award, you will be receiving an awning that is strong and stable, stays taut even when the awning is not fully extended, provides the best protection with a stainless steel roof and fabric roller and additional hinges and joins are made from V4A-stainless steel. The ES-1 is manufactured to meet any kind of weather and is the perfect awning solution for your home. 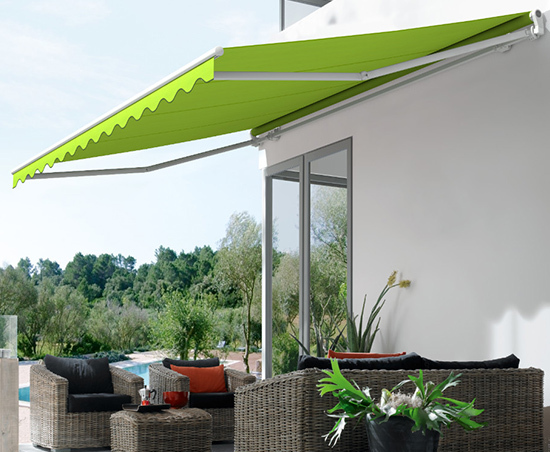 The markilux 3300 pur is one of the most popular awnings due to its ease of installation; it has an extremely tight fit to any wall and is strong, sturdy and very robust. It has a double gutter, allowing water to run off the edges instead of pooling in the middle, meaning that the awning stays in good shape, longer. It comes in shades of white, or grey, giving it a chic and modern look. Our team of specialist installers provide professional garden awning installation services to homeowners throughout Surrey, East Sussex, Kent and South East London. We have already completed projects for homeowners throughout Dymchurch, Rochester, Sevenoaks, Strood, Beckenham, Swanley, Broadstairs, Bexleyheath, Bromley, Maidstone, Harrietsham, Hythe, Sheerness, Ramsgate, Bromley, Orpington, Hollingbourne, Faversham, Dartford, Margate, Whitstable, Erith, Charing, Bexley, Tonbridge, Canterbury, Longfield, Chatham, Sittingbourne, Gravesend, Aylesford, Sidcup, New Romney, Tunbridge Wells, Ashford, West Malling, Sandgate, Ashford, Herne Bay, Gillingham, Folkestone, Dover, Queenborough and Sheppey. Contact our team today by giving us a call on 01732 809341 or sending through an enquiry and we will get back in touch as soon as possible.